Happy Monday Everyone! I trust you had a fabulous weekend? I did. Don worked ALL weekend long so it was just me and the boys. On one hand, it was really nice. We played video games (I mostly watched). But it was nice just to be with the fellas. Jesse defeated the Star Wars - The Force Unleashed video game. I have to admit, that was cool to see the smile on his face! On the other hand, I'm soooo tired of hearing them bicker back and forth. I think they have had enough of one another for a summer. They may not be ready, but I'm so ready to send them back to school. Not to mention, my stamping time will get back to normal. The mojo just hasn't seemed to be there. I'm sure that it's due to the fact that I can't focus on anything while listening to the two boys fussing at one another. I should just feel blessed to have them in my life to listen to at all. But, sometimes, I really feel that I've been tested to my limit. Anyway, the boys and I are headed out-of-town this morning for Woodbridge and the "Big Lego Store" up at Potomac Mills. I think the change of scenery will do us all some good. We are going with friends...Brandi and may have our hands full but it should be tons of fun! We'll be back on Tuesday. Don will just have to hold down the fort while I'm gone. I'll miss him but it will be good for him too. Anyway, I know you didn't stop in to listen to my ramblings. Here's a card I managed to throw together...between the hollering. It's a simple and clean card. The base is Green Galore. The Whisper White panel is dry embossed using the Big Shot and the Small Dots Texturz plate in Backgrounds #1. The ribbon is Rich Razzleberry Polka Dot. 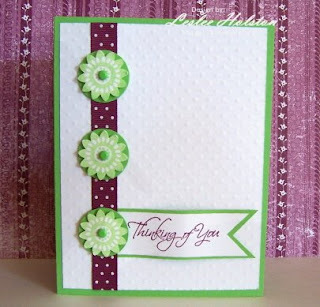 The flowers were first stamped in Green Galore on Whisper White using the flower from the Best Wishes & More set. Then punched using the large flower on the Boho Blossoms punch, mounted on Dimensionals on a 1" circle punched in Green Galore. A Green Galore brad graces the centers. The sentiment is from the Kind & Caring Thoughts hostess set, stamped in Rich Razzleberry. The sentiment tag is wavy (I've been wanting to try that for awhile now). Considering the ciaos this weekend, I think it turned out pretty good. The textured front really fills in the white space perfectly. A good clean card....and easy too. Thanks for looking. I'll post again soon.